How much do you weigh? Are you sure? Turns out you may want to reconsider. It turns out that the “official” kilogram is either gaining or loosing weight (they aren’t sure). Makes you wish the good ‘ole pound wasn’t redefined , doesn’t it?? The solutions? 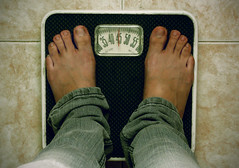 redefine it–the kilogram–as a certain number of atoms of some material? Wow…. I knew there was a reason I didn’t like the metric system….. If you need/want an easy metric -> imperial or imperial -> metric cheat cheet, look here. I was surfing today when I came across this article. 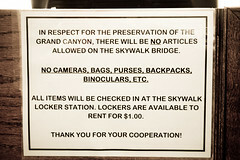 It is about the Grand Canyon Skywalk. From what the article and Wikipedia say about pricing, it looks like a classic tourist trap. People trying to milk money just because they can. ARG! This is such a crock….. This is such a crock. The Democrats can’t have it both ways. The law was changed to its current state in 2004 when Mit Romney was governor. Then, the Dems didn’t want him to appoint a Republician once lurch then Sen. Kerry won the presidency. So, they passed this law. Now, when it no longer suits their purposes (needing seats in the Senate NOW), they want to change it. 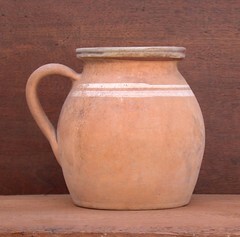 What a crock! Just to clarify….my issue isn’t with the governor appointing the successor or the people voting. I don’t care how that happens. My issue is with the democrats changing the law as it suits their purpose. Before 2004, the governor appointed the successor. The law was changed in 2004 so the people would vote. Now, they want to change it back. While I don’t agree with any of his politics, it must still be rough for his family. 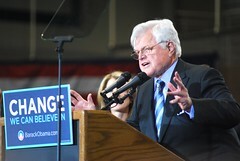 Ted Kennedy has died. For those of you who may not already know, Matt and I are expecting another baby! 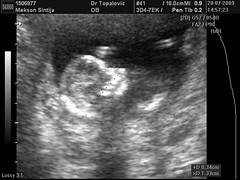 We found out in May and I am due on January 30, 2010. Lydia’s due date was January 31, but she was fashionably late and arrived on February 4 🙂 It has been a bit overwhleming to be pregnant and navigate healthcare in a foreign country, but we have been blessed by helpful friends and an uneventful pregnancy. I had much worse “morning” sickness, lasting quite a bit longer than with Lydia, but I am thankful that seems to be past. It is hard to be in the chubby stage, rather than looking all cute and obviously pregnant, but I’ll be thankful for every day I can still wear my own clothes. It is a little discouraging to have a couple of boxes of really nice maternity clothes buried in a storage unit in WV, but it’s not the end of the world. It’s even harder not to think longingly of all the nice baby things we kept in anticipation of Lydia’s sibling(s). I will say that we may well be having a boy, so I’m not too bummed about not having access to all the girly things Lydia had! But I have to admit that I will miss the rocking chair, airplane mobile, heavy sleepers and blankets, and the stroller/car seat. My dr is nice enough, though he doesn’t speak English, and he thought it was pretty likely at 13-14 weeks that we would be blessed with a boy. My only real reason for thinking that is that I feel so differently this time. As for other medical things, the baby and I look good. I have had 2 ultrasounds and bloodwork done so far (both in June and July), and they don’t want to see me again until September. It is a little different here, at least in our small-ish town. My first appointment involved no history, no weight/height/BP/temp/etc…, just the ultrasound, a question about my c-section scar, and a question to my friend as to whether my first pregnancy was good. The second visit was a little more like what I was used to in the States. I had an u/s, BP and weight checked (both good), and an exam. A quick side note… At my first visit in mid-June, I got a “rx” for vitamins C, E, and folic acid. After talking to my US OB’s office, I just continued the mulitivitamins I already had. I was prescribed proper prenatal vitamins in late July, so I am now taking those! I had mixed feelings about delivering in Cacak, given the age/condition of the facilities and the lack of English speaking personnel (since my Serbian is only about a half step above survival level). I don’t expect to be treated specially as a foreigner, but I do want to be able to talk to my dr and going through a translator, especially depending on one during the actual birth, is something I do not feel comfortable with. A friend’s mom recommended an English speaking dr at the hospital. She speaks no English, but took me to meet him. The age of the facility was not a huge deal as it seemed clean and I know other ladies have babies there every day (though the squatty bathroom that looked to be in the middle of an abandoned remodel was pretty scary), but talking to the dr was not reassuring. He mostly talked to my friend’s mom in Serbian (which I sort-of followed), asked me a couple of questions in English (his seemed fine), looked at my papers from the other dr and told me to come back in September. This 5 minute exchange left me more firmly convinced that having a baby in Cacak was not the best choice for me. One of the main considerations for this is our plan to deliver by c-section. Even if everything were “normal,” I would labor in a room with several other women (no husbands allowed), deliver without Matt, and stay in a ward where Matt could not visit. He could visit the hospital to see me, but only briefly if I could make it to a particular area at the designated times. I know there is little chance that he could be with me for the c-section even in Belgrade, but we could have a private room and he could visit and be with me and the baby much more. Setting aside such preferences, there is also the matter of safety. If anything would be wrong with me and/or the baby, we would be faced with a 3 hour ambulance ride to the capital (barring traffic and winter weather). We are not expecting problems, but we feel it is the wisest thing to start out in Belgrade, taking advantage of the best facilities available. We still have to navigate the system and figure out the real scoop on procedures and payments (we have heard some wild tales about both things!). It can be overwhelming at times, but God is not surprised by any of this. He knew this child before “he” was ever conceived and He is with us through this whole experience and beyond. Even if we don’t know what’s going on, He does!! I do have a word to say about VBAC (vaginal birth after Ceasarean) vs. c-section. I did not plan to have a section with Lydia, but given her breech position after the onset of labor, I tearfully accepted the dr’s recommendation. The experience was so much better than I could have hoped and I would have had mixed feelings about VBAC in the States, even if my dr encouraged it. I was challenged yesterday to think more about it, which I did. I couldn’t sleep last night after Lydia woke up thirsty, so I spend half the night reading tons of articles and stories. Everything confirms that with the right set of circumstances, VBAC can have positive outcomes for mothers and babies. Many hospitals and drs will not support VBAC given the additional risks and liabilities, though just as many seem to be fully supportive. I read plenty of success stories (even women having successful home births after multiple c-sections), but also heartbreaking stories of failed attempts at VBAC or those that resulted in trauma or death for the baby. Knowing that it is really my choice, I feel great peace about proceeding with a planned section. Personally, having a great previous c-section does have an impact on my feelings. I am 3 yrs older and in a completely different environment, so it may not be nearly so easy this time around. But I feel that it would be reckless, especially given our distance from Belgrade, to attempt a VBAC and end up having an emergency c-section in a foreign country. By making arrangments with the dr and scheduling in advance, we are making the best of a less than ideal situation and giving the baby and I the best chance to have a positive experience. I am not sad or scared to have the baby here, but I am realistic and recognize that being an outsider has a direct impact on my ability to understand and be understood during this special time. I have pictures from my last ultrasound to post soon and I will do my best to share interesting pregnancy and parenting stories from abroad in the months to come!! 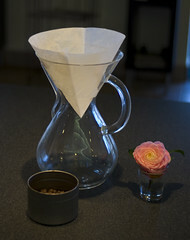 As seen over at BoingBoing …a chemex coffee pot . Looks awesome and will go anywhere you can boil water. Cyndi made apple pie yesterday. I’m going to have some for breakfast. 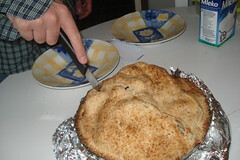 Note, these pictures were from another apple pie she made…not this one. 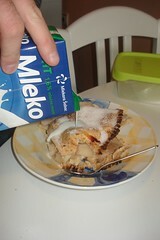 But, OF COURSE, I ate it the standard way (in a bowl with sugar and milk).